"As most folks know, the worst places in the world for gossip, slander, back-biting, and malicious talk are the work place, school, and, yes, in church. If people are talking about you, and not in a good way, you owe it to yourself to stop that mess. There is no real need for angry revenge spells, jinxes, or reversing the bad stuff back onto them if you can just SHUT THEM UP. Stop Gossip is an old, tried-and-true formula containing Slippery Elm Bark that seems to make harmful talk slide right past you. Use the oil to dress any place you deal with back-biting people. Launder your undergarments with a sprinkle of Stop Gossip Bath Crystals in the rinse cycle. Dress business papers with Stop Gossip Sachet. Keep a vigil light burning at home." The label shown here is from a Lucky Mojo brand Stop Gossip Vigil Candle, burned by those who wish to put an end to harmful rumours, back-biting, and slander. 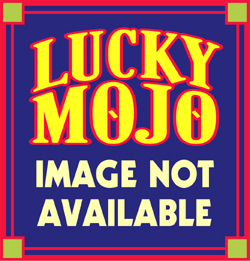 The same herbs and fragrances used to dress this candle for customers and clients are the basis of Lucky Mojo Stop Gossip dressing oil . used for anointing oneself, fixing the home, preparing purple offertory candles or feeding a mojo bag. These herbs and scents also can be found in Stop Gossip incense powder, sachet powder, and bath crystals. Stop Gossip is one of a family of related formulas that also includes Fiery Wall of Protection, Reversing, Court Case, and Boss Fix products. Each one of these old-time recipes is slightly different -- some placing emphasis on protection or return of evil to the sender, others on subtle mastery of one's ostensible superiors or victory in legal conflicts, or all of these combined with justified demands that must be met -- but they have in common the underlying aim of enhancing the magician's internally generated forces, enabling action upon the external world. The above formulas may, of course, be mixed and matched in any way that suits the practitioner, or may be teamed up with formulas from another line of goods, such as a financial or money luck formula like Money Drawing, a passion and sexual love spell formula like Love Me. or a legal case formula like Court Case or, if legal discretion is necessary, an outside-the-system formula like Law Keep Away. 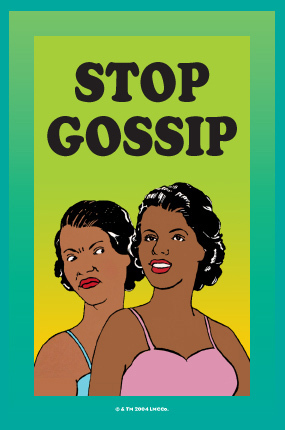 How you choose to use Stop Gossip spiritual supplies is, of course, up to you, and there are many ways to lay down tricks that utilize Stop Gossip products. 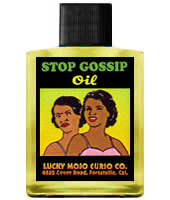 Some folks like to dress business papers with Stop Gossip sachet powders to limit back-biting on the job; others wear Stop Gossip dressing oil as a scent or use it to fix their desk, locker, or work space. Some folks prefer to undertake a more complex spell that may involve burning a candle and incense. They may light a brazier of Stop Gossip incense, carve the person's name with a coffin nail into a black offertory candle, or a devil figural candle, or a Stop Gossip vigil light candle. The candle would then be dressed with Stop Gossip anointing oil, in conjunction with recital of the 37th Psalm, while praying for all that is desired. Work out of doors in a fire-safe environment. You will need a photo of the person, on which you write the person's name (and birthdate, if known). Use a black marker to draw an X on each eye and a zig-zag line over the mouth to stitch it up. Use sewing pins to pin the mouth as well, going in and out with at least one pin, and more if the photo is a close-up. Lay the photo flat in a metal bowl or skillet. Get a white candle -- 4", 6", or 9" but not a glass-encased candle -- and stand it on the paper. Pour Alum all around the candle in a ring, deep enough to hold the candle upright. Dress the candle in place by pouring Stop Gossip and Run Devil Run Oil on the candle. It does not matter if some gets into the Alum. Recite Psalms 37 ("Fret not thyself with evildoers...") and light the candle. Pray as it burns. When the candle gets low, and well into the alum, add a bit of Florida water to catch everything on fire, including the paper and all, and recite Psalms 1 ("Blessed is the man that walketh not in the counsel of the ungodly..."). After the flames die down, scrape out the skillet and carry all of the ash and carbon and mix it with Stop Gossip Sachet Powder. Carry it to a crossroads and blow the powders in every direction, to the four winds. Walk home and don't look back. Clean the skillet, then heat pure olive oil in it to re-season it, and consider it spiritually clean again. This Psalm is generally recited when one is faced with a wicked, false accuser, a gossip, or a busybody who is interfering in one's personal business. It is also used to break false testimony when there is a legal component such as an arbitration, case appeal, or court case. It may be recited while bathing or when setting lights. 6: And he shall bring forth thy righteousness as the light, and thy judgement as the noonday. 28: For the LORD loveth judgement, and forsaketh not his saints; they are preserved for ever: but the seed of the wicked shall be cut off. 30: The mouth of the righteous speaketh wisdom, and his tongue talketh of judgement. There are thousands of specific spells that employ a variety of hoodoo spiritual supplies. Here are some of the other ways you can use Stop Gossip brand spiritual supplies to achieve the results you desire. You may perform spells to cut down gossip or shut the mouths of liars whenever you desire. If the need is not urgent, you can take time to align your spell-casting with cosmic forces and work by a Waning Moon Phase, so that the Moon grows smaller while you work and their influence is diminished thereby. But don't let the Moon Phases hold you back: if the timing is not right, you can do the work whenever it is best for you. 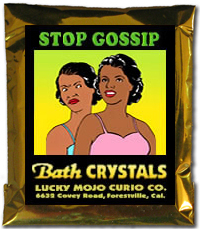 Before dawn dissolve half the packet of Stop Gossip Bath Crystals into a tub of hot water. Pour the water over your head 9 times as you say the 37th Psalm and name what you want. Air-dry yourself and collect a basin of the used bath water, which now has your essence in it. Dress in fresh, clean clothes, carry the basin of bath-water to a crossroads and throw the water toward the sunrise in the East. Walk back home and don't look back. 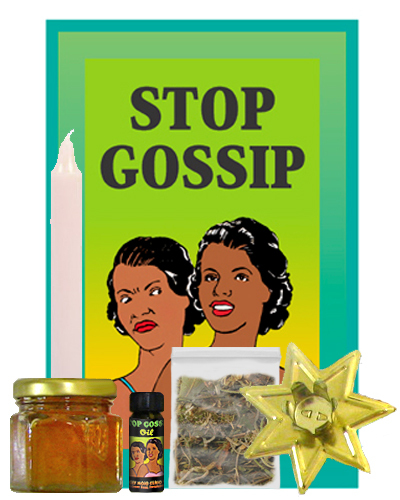 Similar to Stop Gossip spiritual supplies is the Mexican magical soap known as Tapa Boca or Tapa Voca, which means Shut Your Mouth. This soap can be used on the job, by substituting it for the regular soap bar in the bathroom where you work. 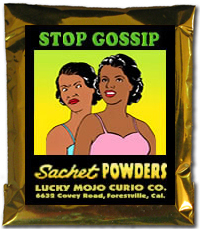 Dust your body, your important paperwork, or your socks and shoes with Stop Gossip Sachet Powder, or sprinkle a pinch of Stop Gossip Sachet Powder in the four corners of the room where you plan to meet with those whom you wish to influence. Each time, say the 37th Psalm and name what you want. Make the Stop Gossip Incense Powders into cones (use a twist of paper or a small candle snuffer cone, pack the incense in with your finger, and turn it out of the cone) or place it loose on a brazier. Many people find that keeping a pot of Incense smoking while they work increases their ability to break through into a spiritual space or magical way of working. Carve the full names of the gossiping or back-biting people (or the generic term "All Those Who Gossip About Me" on a black Offertory Candle and dress the candle with Stop Gossip Oil. As you dress it, speak aloud your petition, such as, "With the help and grace of God, may this matter come to a satisfactory resolution. May their mouths be shut and sealed, and their slander trouble me no more." If you want the spell to be ongoing, or want a light at home to "back you up" while you are about your business, you would be better off to use a fixed and prepared Stop Gossip Glass Encased Vigil Candle. Write your petition on paper, cross it with your name written 9 times, and set the Vigil Light in a safe place, such as the sink, bath tub, or shower stall, where it will not cause any problems while you are out. Whenever it is convenient for you, dissolve the remaining half of the bath crystals in hot water and add the liquid to the rinse water when you do your laundry, especially your underwear and stockings. When you wear these clothes, you will be "dressed" for luck. If you are in a position to do the laundry of the person who owes you the money, do this to their clothing instead of your own, so they will be wearing your command. It is important to properly dispose of ritual remains. Because these are magic spells for protection, you may want to keep the remains around your home. Wrap up any left-over candle wax, incense ashes, and used sachet powders in a piece of cloth. Secure and tie it with thread or string. Bury it in your back yard.